Archaeologist Louis Seymour Bazett Leakey was a young student in the early 1920s. He would often ask his professor at the University of Cambridge in the UK if he could set out for Africa to track early humans. “Don’t waste your time; everyone knows humans originated in Asia” would be the professor’s terse reply. Today, every schoolbook describes Africa as the cradle of humans; it was not so then. Though Charles Darwin in 1871 postulated an African genesis for humankind based on our outward resemblance to chimpanzees and gorillas, evidences gathered since had suggested otherwise. In the early 1890s, Dutch physician Eugene Dubois discovered a hominid fossil, Homo erectus, on the Indonesian island of Java. With additional discoveries of similar fossils, such as Homo erectus pekinensis in China in the 1920s, most anthropologists and palaeontologists favoured an Asian origin for humans. They thought humans are closely related to Asian apes, such as gibbons and orangutans. But Leakey had his doubts. Born to British missionaries in Kenya, Leaky lived all his childhood in Africa. Roaming in the wild, he often found stone tools in the riverbeds. At 12, he spotted a fossil. The finds instilled a curiosity for prehistory in him. Who made the tools, he wondered. Archaeology became his passion. After completing his studies at Cambridge, Leakey returned to Kenya. By this time, he was married to his second wife Mary, a spirited woman with a scientific bent. 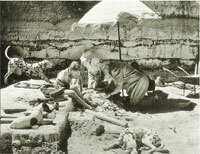 Together, they visited Olduvai Gorge in Tanzania in 1935. Mary was captivated by the spectacular landscape of the 48-km-long, 90-metredeep, erosion-created canyon. Its walls were neatly stratified into layers of dirt and rock, interspersed with volcanic ash and lava. They excavated the site. Wherever they dug, they found tools— first in hundreds, then in thousands and then in tens of thousands. There were hand axes, scrapers, choppers and several others—all Stone Age tools. They also found fossilized animal bones, many with butchery marks revealing how the tools were used by early Africans. But the toolmakers were nowhere in sight. One fine morning on July 17, 1959, Louis was down with headache and Mary went out for her usual prospecting. On a hillside, she saw a scrap of bone projecting from below the surface; it looked like a piece of skull. She brushed away the sediment and saw parts of two large teeth of an upper jaw; they definitely belonged to hominids. At last, a trace of the toolmakers. The skull was in 400 pieces. Mary assembled the bits and the reconstruction revealed a small-brained creature. The skull was about 500 cubic centimetres (cc) in volume; the modern human skull is of 1,400 cc. It had huge molars for heavy chewing and was hence, dubbed nutcracker. Later, the species was named Zinjanthropus boisei or Zinj in short. The Leakeys used the new potassium- argon dating method and found the fossil was over 1.75 million years old; until then the oldest human ancestor was thought to be of not more than a few hundred thousands years. Since the fossil was found in a tool-bearing layer, it was clear Zinj was the toolmaker and had been around Olduvai for a long time. The news hit the headlines. It was the beginning. The next year, the Leakeys discovered two other toolmakers— Homo habilis, the handy man, and Homo erectus, the upright man. Based on further classification, Zinj was renamed Paranthropus boisei, a bipedal species that lived during the time of several species of Homo. The evolution of humans was becoming clearer at Olduvai. The finds rewrote history: it made Africa the cradle of humankind and put our origin to a much earlier date. It is pivotal in understanding our roots in the Stone Age.